Yesterday I ran my 8th race while pregnant, the Gender Defender 5K on the Quantico Marine Corps Base! I hadn’t raced since the 4th of July back when I was 28 weeks, so I was very excited to get back out there! I put on my “Running for Two” race shirt for the first time in 7 weeks and realized just how much I had grown since the last time I wore it! I was also very excited for this race because my dad and sister were visiting from Pennsylvania and I had a lot of friends running the race too. I started to get a little nervous the day of the race though, because it was an evening race starting at 7 p.m. and it had been raining all day long. I’m no stranger to running in the rain and I actually enjoy it, but I was worried I would slip and fall or something since my balance is already off at 35 weeks pregnant. Arriving on base… still raining! This race was part of the Marine Corps Marathon series, and these races are never disappointing. They are always super organized, draw a lot of people, and give out a lot of great race swag. I’ve done a bunch of the races in the series, including the Marine Corps Marathon, Crossroads 17.75K, Turkey Trot 5K, and I ran part of the Historic Half Marathon with my friend Amanda this past May. Every race has been awesome and so was this one. Even though it was ‘just’ a 5K, they really went all out to give the runners a great experience. It was a battle of the sexes themed race, and all about the blue vs. pink. They encouraged the women to wear those colors and had awesome finisher areas for the men, which included beer, pizza, bottle openers, men’s shower and shave gel, and more. The women’s finish area had flowers, wine, luna bars, and a ton of other things. We all received technical race shirts that were awesome, and a special challenge coin upon finishing the race instead of a medal (a military tradition). We ran into my friend Amanda right away. You might remember her from the Hot Chocolate 15K and the Historic Half. She’s no longer a race newbie and is rocking tons of races now! We picked up our race bibs and shirts and waited around for the rest of our friends to show up. It wasn’t raining anymore and it was cool and breezy outside. Perfect running weather! Eventually the rest of our crew showed up. I was loving all the pink! The race director told the crowd that 65% of the runners were females. Yay for strong women! As we waited for the race to start there was a lot of entertainment to keep us occupied. Vendor booths, a DJ, a little pony, and many people asking about my shirt and pumping up my ego a little bit 🙂 I met a ton of pregnant runners too, which was awesome because I haven’t seen too many of them at races. My dad loves the candid shots! It was so nice to have my family there. They have only ever been able to come to a handful of my races, so it was really special to have them there. My sister runs too (she is a graduate of the Couch to 5K program!) but has a knee injury right now so she couldn’t run with us. Maybe next time! Eventually it was time to make our way over the start. It still wasn’t raining even though the skies were looking dark and I was hoping the rain would hold off. I said goodbye to Kevin since he was going towards the front, and Amanda and I headed to our spot. The Color Guard presented the colors, we sung the National Anthem, and in true Marine Corps fashion the starting gun went off at exactly 7 p.m. Gotta love the military and their punctual race starts! I stayed with Amanda for the first mile of the race and she told me we were running about a 9:30 pace (I wasn’t wearing my Garmin). I knew I couldn’t maintain that so I told her to go ahead after we passed the first mile marker and started running at a more comfortable pace after that. I didn’t take too many pictures because the rain started up shortly after Amanda went ahead of me. I slowed down a bit and watched my step to make sure I was being safe. I made the big mistake of not going to the bathroom right before the race started so I was dealing with an uncomfortably full bladder the entire time. It was causing a lot of pressure down below but that was my only complaint. I felt good otherwise and didn’t even mind the rain! Meanwhile, my dad was at the finish line waiting for all of us to come through. He got the first place male finisher who ran the 5K in 17 minutes, and in true battle-of-the-sexes form the first place female was only 45 seconds behind him, finishing in 17:45! Then Kevin came through, finishing in 23:56! This was only his third time running in like two months, I have no idea how he is so fast without training. I think he’s naturally built for speed more than distance. A few minutes later my friend and favorite Body Pump instructor Gina came through the finish line. Amanda was next! Sidenote: Isn’t my dad a great race photographer? I told him he should photograph races as a side job on the weekend for one of those companies like Brightroom or Marathon Foto. Then I came through – finishing in 32:45, which is an average pace of 10:33/mile. Faster than I have been running recently! I was very happy with that, especially since my last 5K was 31:39, 7 weeks ago with a much smaller belly 🙂 I also met my other goal which was to try to run the whole thing without walking. Woo hoo! Right after me my friend Danielle finished. This was her first race ever and she has just finished the Couch to 5K program. She was so nervous for this race but did an AWESOME job! She is already doing another 5K in a few weeks and the Army Ten Miler in October! Go Danielle! After the race we went to our finisher’s area for food, flowers, wine (Not for me! Soon though! ), and free race swag. 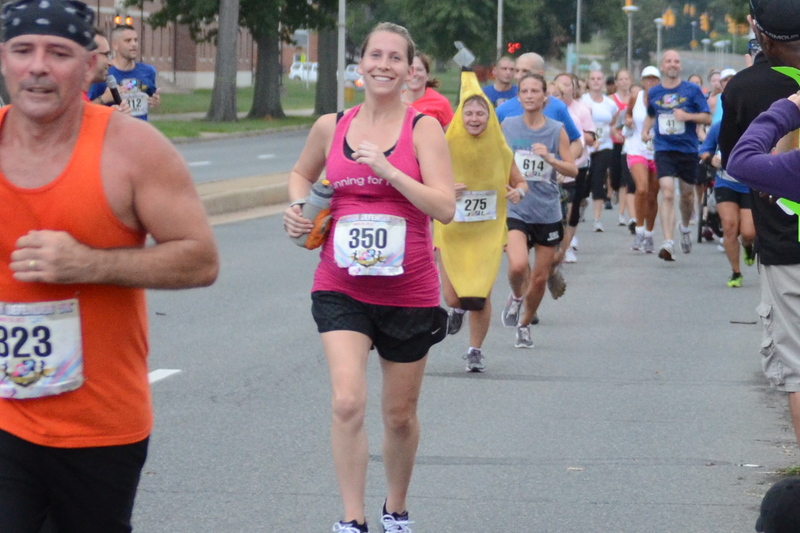 The Gender Defender 5K was a great race for so many reasons. It was fun, had a great theme, and was well organized. But I think the best part was being at the race with so many people that I love. One of the best parts of running for me is the running and racing community, and I love sharing these types of experiences with people. This entry was posted in Uncategorized and tagged Baby K, Family, Friends, Kevin, Pregnancy, Races, Running. Bookmark the permalink. What a fun time! Love it!